Whether you’re starting new, or paring down to the essentials, it’s always handy to have a list of kitchen essentials to refer to. Why waste money and clutter your life with duplicates and unnecessary objects. Imagine neat and organized drawers. You know exactly where everything is and never waste another moment searching for the carrot peeler. Everything has it’s place so it’s easy to put away, resulting in less mess. You have all the tools you need to cook at home and avoid expensive takeout, without adding clutter to your minimalist kitchen aesthetic. 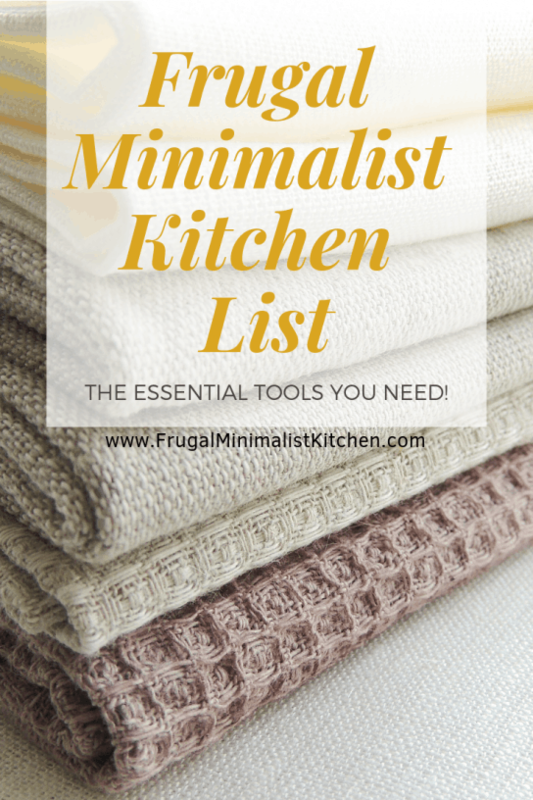 For the purpose of this post, I only included kitchen tools on my minimalist kitchen list. I’ve left the pantry staples for a separate list or else it would just get too long. Some of the items I listed are an investment. I’m of the philosophy that you actually save money and effort in the long run by investing in good quality goods that last a long time, rather than buying the less expensive option that may wear out much sooner. I don’t like shopping for small appliances or other stuff like that so I’d rather just do it once and get a blender that will do the job right and last me a decade or more. I do this for simplicity sake, but also for saving money, being more eco-friendly, and avoiding the consumer trap of planned obsolescence, which I cannot STAND! I hate seeing things be thrown out because they were made cheaply and designed to break with in a year or two. What an absolutely disgusting waste. Within each section, I’ve included notes where something might not be absolutely essential, but would be very handy. I’ve also made note where I think it’s important to invest in high quality, and where I think you could save money by buying a less expensive option. Some things may be essential to me, but not to you, depending on what you like to cook, your family size, and the design of your house. For example, you probably don’t need a dish rack if you have a dishwasher, and you might not need a kettle if you never drink tea. This list is just a guideline based loosely on what must-haves are and you should feel free to adapt it to include the things that are essential to you. Cooking tools like pots and pans are worth investing in to get good quality. I recommend stainless steel pots and a cast iron frying pan. When taken care of, they can literally last a lifetime. 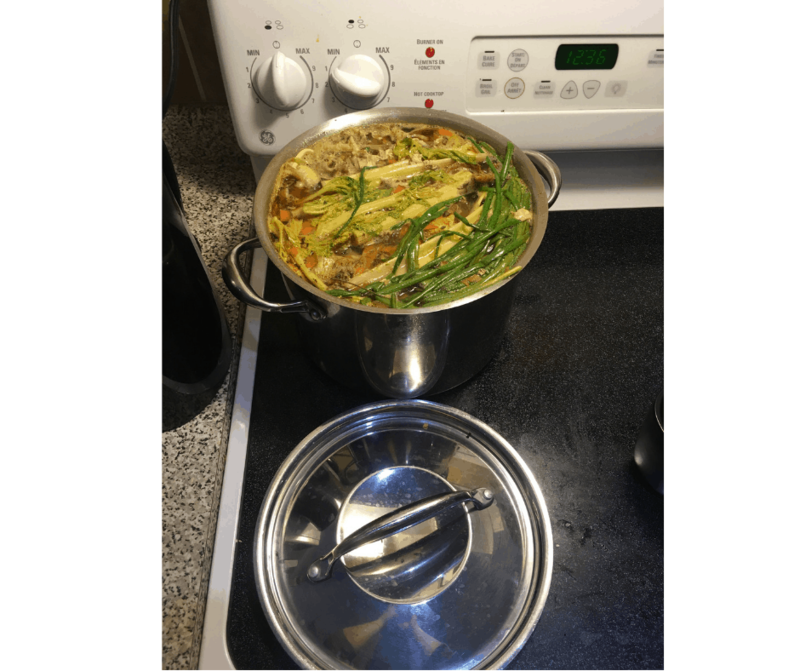 It would probably save you money over time as well, for example if you have to buy a new non-stick pan every year or two because the finish is peeling, you will definitely pay more over time than investing in a quality cast iron pan. 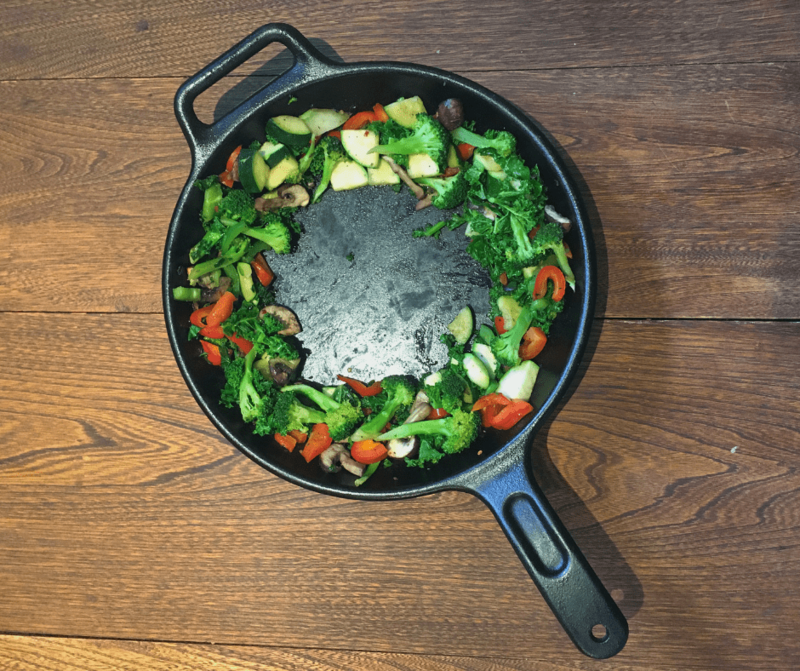 We use our cast iron frying pan almost every day! You might need more or less than this depending how big your family is or if you bake a lot. That’s ok. You can and should create your own personalized minimalist kitchen list that meets your needs. Honestly, I think the utensils can be a huge clutter trap. They take up so much space because most of them don’t stack and then your drawers get jammed! Ruthlessly pare down to the essentials, and try not to collect things you don’t need or use that often. Another tip is to get multi-purpose kitchen utensils that serve more than one function. For example, we have a veggie peeler and scrub brush combo (similar). Even just a few multi use items can make a difference in how much you have to dig around to find what you’re looking for. Also smarter tools are great, like whisks or graters that fold flat. A lot of utensils can be bought fairly cheaply, but avoid the cheapest ones made of flimsy, non-heat resistant plastic, or thin metal that will break within a year or so. It’s pretty easy to assess the relative quality just by looking at and holding the piece. I’ve seen great quality things at the dollar store, and crappy quality things at high end kitchen shops, so this is one area that you could easily spend less. The key with small appliances is to make sure you only keep ones that you use regularly, like at least every couple weeks. We use these at least weekly, so to us they’re worth the space they take up. We could do without a kettle, microwave, and slow cooker, but they save a lot of time and effort, so are definitely worth having. You might have seasonal stuff, like canning equipment or a dehydrator to preserve produce from your garden. I’d recommend storing those seasonal/rarely used items away from the items you regularly use in the kitchen. That could be in a hard-to-reach part of the cupboard, or in your basement or garage. Better yet, see if you can rent or borrow that equipment when you need it and get rid of your own. I’d recommend getting rid of other stuff you use infrequently that could easily be replaced by something else. For instance, fancy china or serving dishes that are only used a couple times per year. Why not invest in everyday options that are still nice enough to dress up for entertaining. You don’t need themed holiday platters for every occasion (Christmas, valentines day, Easter, spring, summer BBQ, fall, thanksgiving, etc.). Why not use your baking dishes and regular plates and bowls to serve food? That’s what we do. It’s not the fanciest, but who really cares? If you really want nicer serving dishes, invest in a few neutral pieces in white, stainless steel, or clear glass that you can dress up or down for any occasion. For the ultimate minimalist kitchen list, I recommend getting a set of dishes that all match. Maybe that’s just my pet peeve when the plates are all different sizes and don’t stack properly. Find what works for you. You don’t necessarily have to buy the whole set, if say it comes with giant bowls but you prefer smaller ones. Or if you want 8 pieces, but the sets come in 6, so you’d either be short or have more than you want. Consider buying separate coordinating pieces instead, so you get exactly what you want. Multi-use dishes are the best. Do you really need tall drinking glasses, short drinking glasses, white wine and red wine glasses? Why not get a set of glass stemless wine glasses, like these, that work pretty well for all those purposes, instead of 4 sets of glasses that are perfect for their respective purpose? It may not be right for you, but it’s something to consider. The unglamorous part of the list, but essential none the less! You can’t have a minimalist kitchen without including the cleaning essentials on your list. I think eco-friendliness goes hand-in-hand with minimalism, so having reusable tea towels, dish rags, and a compost bin are definitely an important part of my minimalist kitchen list. 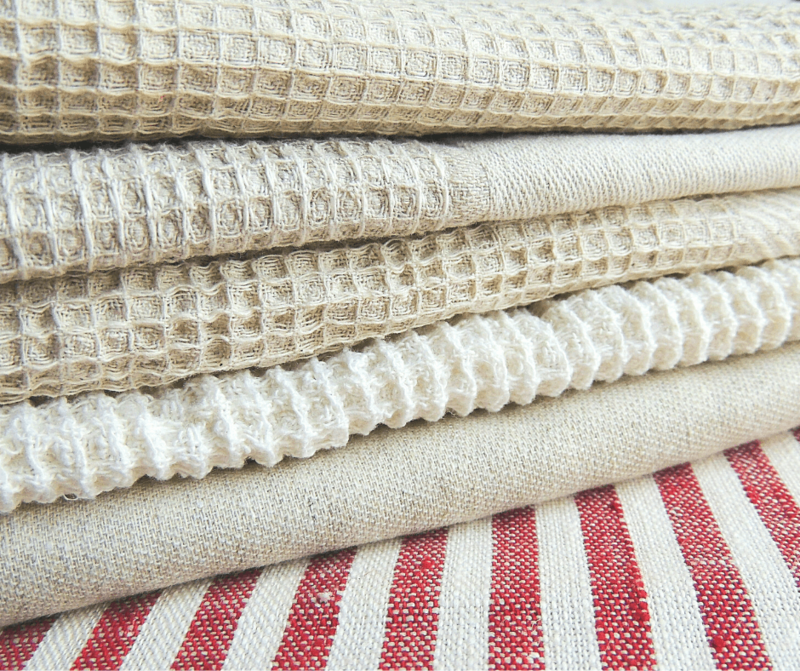 I like to have tea towels and dish rags always available to avoid using paper towels. The dish drying rack would be optional if you have a dishwasher, but I think it would still come in handy, especially if your house only has one sink. A dish drying mat could be a good alternate option if you only hand wash a few dishes here and there. Proper storage containers are SO vital to keeping your kitchen feel minimalist. There is nothing more frustrating than searching through the Tupperware cupboard for the matching lid, or finding leftovers in the fridge that were forgotten about because they were stored in a reused yogurt container! I prefer glass food storage containers with snap lids, like these. This way you can see what’s in there, reheat it safely in the microwave, plus, be confident it won’t leak if you pack it in your lunch bag. Also searching through a bunch of mismatched containers and bags for the spice you want is frustrating and can make cooking take longer than needed. I think it’s worth the investment to get a set of spice containers that you can refill. You might even save money. If you think about it, you buy a new jar or tin each time you get a spice. Why pay for the containers multiple times, when you can simply refill the containers you already have? We refill our spices at the bulk food store which saves us money, and reduces plastic waste as well! Remember that having too little in your kitchen can just as easily be inconvenient as having too much. Being too minimalist can cause you to avoid cooking if everything is just too inconvenient without the proper tools. Don’t go too far in purging. If you’re not sure if you really need something or not, try taking it out of the kitchen and see if you miss it. It’s perfectly ok to use all reused storage containers like jars, or to only use a perfectly matching set of containers. It’s also perfectly ok to use a combination of matching sets and saved jars to store leftovers. Whether your ideal minimalist kitchen list includes more or less than my list, choose what works for you. I love using small mason jars (the 4 oz size) for spices. It’s pretty and since they’re stackable, you can see all of them! One more thing I’d add to the list would be a sharpening steel for the knives. It makes me feel chefy! Lol. And in a small town there’s nowhere to go to get the knives sharpened professionally so it pays to do regular upkeep. You’re so right! I will definitely add a sharpening steel to the list! There’s nothing worse than dull knives. Plus having your own can save time and money versus having to go to a professional, even if there is one nearby.